Post conference, we jumped in our rental and drove south to Myrtle Beach. It was unseasonably wet and cold most of the time we were there, but it's a good thing the Gaertners don't need sunshine to have fun. 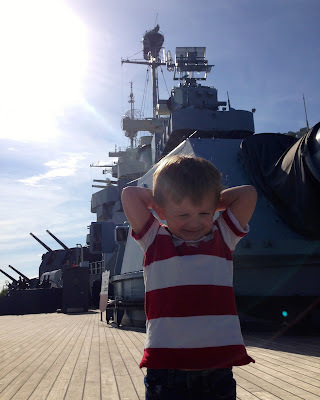 First item on the agenda was to stop at a battleship. Because it was on the way and Jon loves this kind of stuff. Next, go to Walmart for a kite. Then turn into pirates and hunt for treasure (seashells) on the beach, make a fort out of your treasure, bury the fort so no one else will find it, laugh until it hurts, and get insanely sandy. Then take a nap on the beach. And a place that let's you hold baby animals like chimpanzees, wolf pups, and tiger cubs, for a nominal fee. Jon: "I held a baby monkey wearing UNDIES!" Like I said, who needs sunshine to have fun on the beach? But possibly the best part for me was at the end of the day, when we'd put these two tuckered-out puppies in the bed and watch them sleep.